Latex mattresses get a bad rap. Consumers who are uneducated about natural latex mattresses may have misconceptions about latex in particular, given its associations (latex hospital gloves, latex condoms, etc. ), and latex mattresses in general. Even the word “latex” sounds synthetic – closer to the word “plastic” than “natural,” which may be the source of the confusion. This article debunks five common myths that surround latex mattresses, particularly their components. After reading it, you can make a knowledgeable, informed decision about whether it will be the right choice to give you the restful sleep you deserve. Not true. Some people think latex is an artificial chemical, therefore unnatural. In actuality, it is exactly the opposite. Latex is a natural material made out of rubber sap which is harvested from trees. This sap is added to other organic products to make the natural latex mattresses. A number of latex mattress brands are even certified organic by GOTS. The Global Organic Latex Standard (GOTS) is a material and processing standard for organic latex, overseeing the manufacturing, packaging, distribution, processing and selling processes. All forms of latex mattresses have a pinhole design that allows air to move around freely creating a cooler sleep environment. 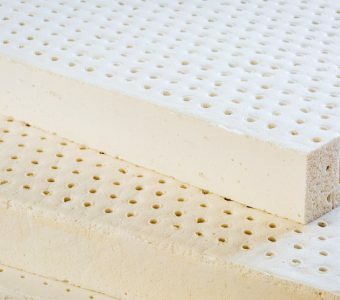 NOTE: most people having heat issues with latex should look to their mattress pads and sheets which may contain materials that do not breathe properly. On the contrary — latex naturally resists mold and dust mites which are some of the top causes of mattress-based allergies. What’s more, a natural latex mattress does not have harmful artificial flame-retardant chemicals. That also goes for other chemicals that factories sometimes put in beds to ward off dust mites and mold. You might find relief from mold, dust mite, or chemical allergies by sleeping on a natural latex mattress. Don’t knock it until you try it! In fact, latex has natural comfort and cushioning properties which support your body and foster proper spine alignment. Similar to memory foam mattresses, a natural latex mattress “hugs” your shape, from head to toe. Denser body parts (like the hips) will sink into it, while the rest will be supported naturally through even pressure distribution. Another common myth. Many people believe that just because latex has a soft feel, it is prone to move a great deal, when in fact, a natural latex mattress has enough viscosity and density to keep you in one place and prevent you from rolling into your partner. If you’re looking for a good, restful nights sleep, try a quality latex mattress from Mattress World Northwest. Our knowledgeable Sleep Specialists are happy to help you find a bed that fits your preferences and budget!